On the way up, the wide-open spaces did their usual psychoactive number on my head. 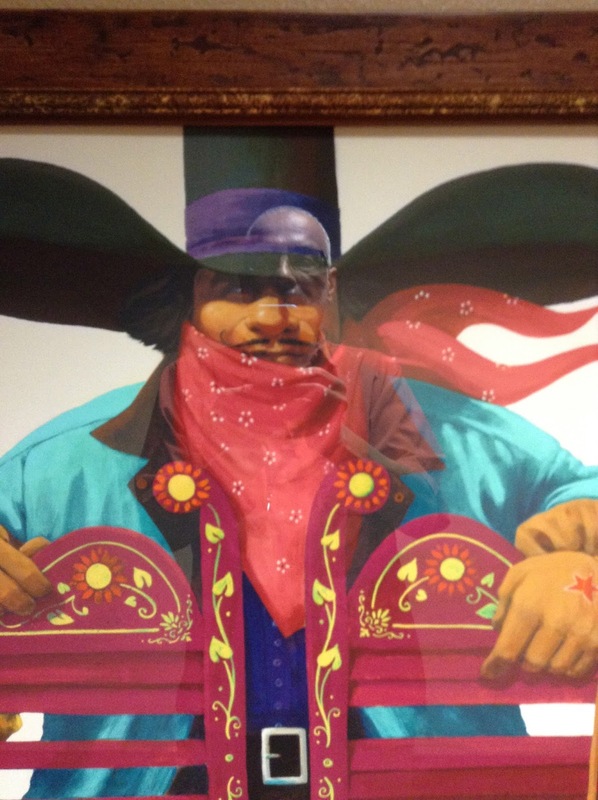 Fragments of my new project -- another Aztláni western story/novel/whatever -- danced across my sparkling synapses. Fresh signs warned to watch out for burros and elk, and a huge flock of hawks patrolled near Black Canyon City. 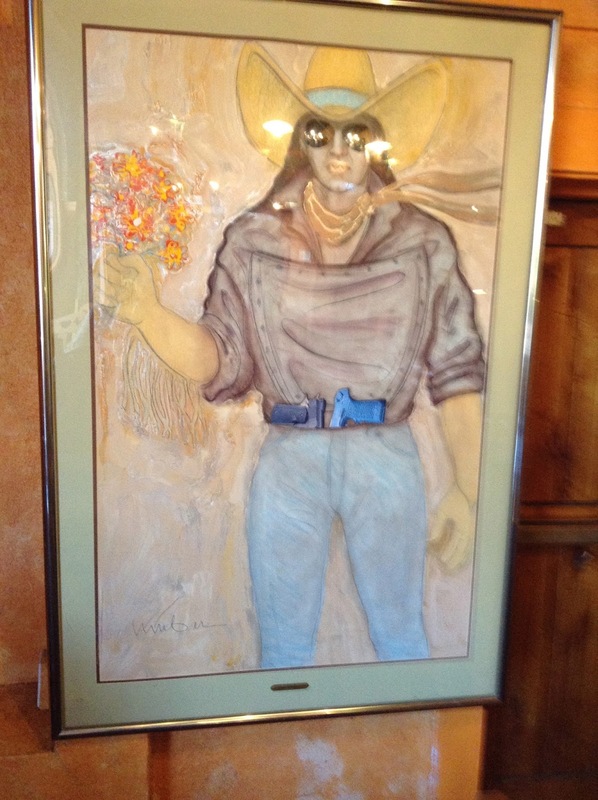 In Sedona, the Bell Rock Inn was brimming over with funky western art. James Darum cowboys lined the halls, a print of Roberts Shields' Southwestern Robots hung in our room. 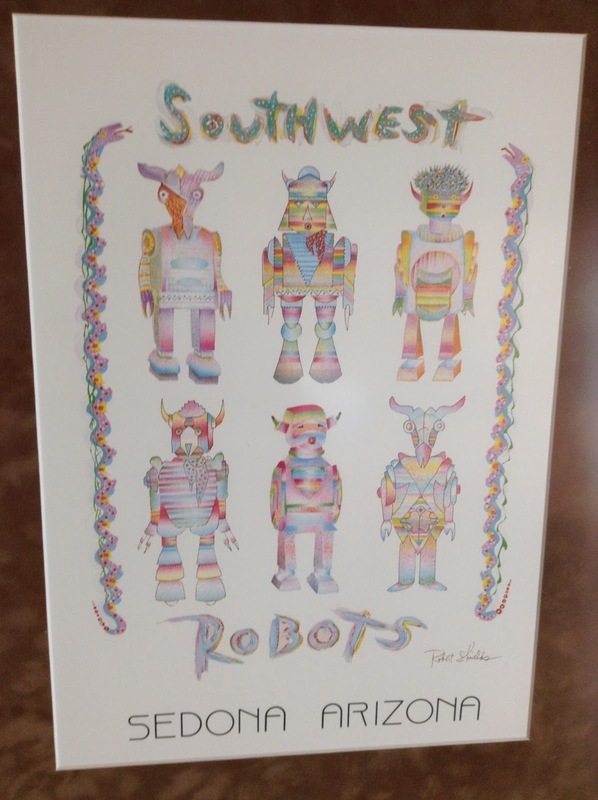 There were also cartoony coyote cowboys, nearly-psychedelic desert/mountain landscapes, and much, much more! 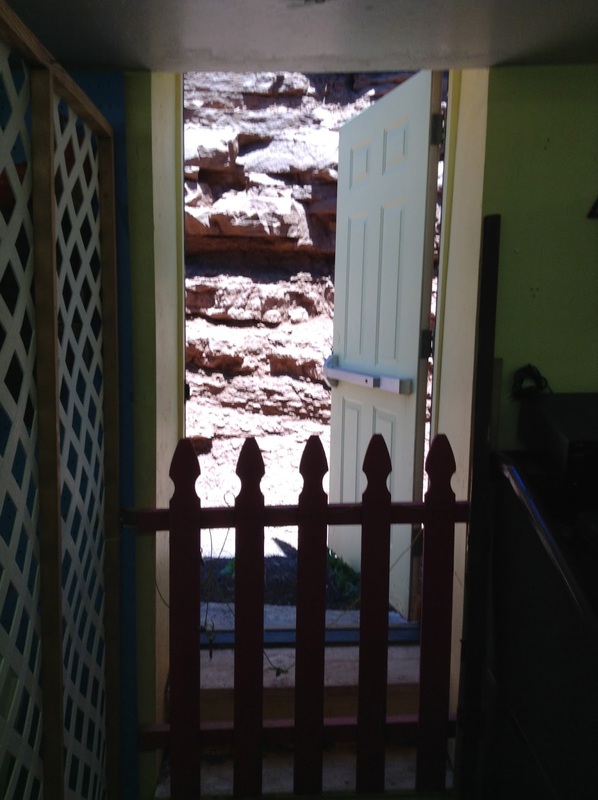 In the bathroom of one of Sedona's many tourist information centers, I saw an example of Navajo graffiti: HÓZHÓ. I dutifully wrote it down and photographed it, figuring that I had some research to do. When I showed it to Emily, she knew it meant “balance.” Maybe it needs to be written on more walls. I wondered what kind food they serve at Mariposa Latin Inspired Grill, but we had some favorite restaurants to visit, like the Coffee Pot. I had buckwheat pancakes the first morning, and huevos rancheros the next. In Flagstaff antique stores Emily got a camel saddle – she'd been looking for one for twenty years – and a statue of an Asian deity of mysterious gender. I got an old bullfighting novel, The Brave Bulls, written and illustrated by Tom Lea, reminding me that I have to get back to my unfinished science fiction bullfighting novel. As we went down Route 66 to the Galaxy Diner, Bob Dylan's The Times They are A-Changing leaked out of an open-air cafe. Back in Sedona, we investigated a place with a giant white rooster in front of it. It's officially called Silver Son West, but Emily wants to call it the White Rooster. It had roosters, dragons, calaveras, buddhas, dinosaurs, and other things that would make great décor for an the wildest western of all time. I had a vision of a vampire being chased through such a place, crashing into a wall of ornate metal crosses, bursting into flames . . . now if I can just come up with a story or something I can use that in . . . 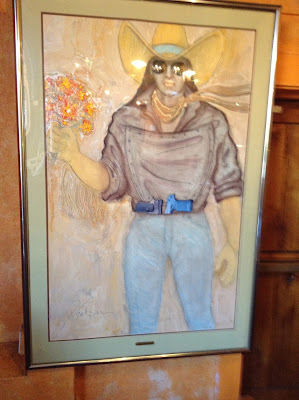 In Oaxaca – one of our favorite Sedona restaurants – there was a Mick Reber painting: Small Dreams of City Streetlife. I was surprised to see guns, in a contemporary setting, with a hint of social commentary, instead of props in Wild West myth. Maybe the times really are a-changing. The next day, we took highway 89A through Jerome down to Prescott where we had lattes at the Firehouse Coffee Co. on what was known as Whisky Row. These days there are more antique stores than saloons. 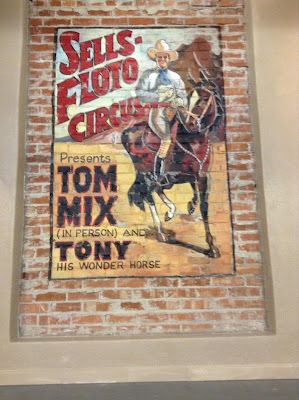 There was a wonderful Tom Mix mural, and I wondered what the hell is Dave's Total Insanity Sauce, and why would they be selling it. In the footsteps of ancient cowboys, Emily found just the piece of furniture to go next to our front door, and just under the androgynous deity. I found a Buckminster Fuller book, a Hopalong Cassidy novel, two Bomba the Jungle Boy novels, travelogues about cannibals and head-hunters, and Christina Garcia's The Lady Matador's Hotel, a recent bullfighting novel that has been tempting me. Could it be my own bullfighting novel is demanding to be finished? And then there are all those other unfinished projects. Guess I better get to work.